Set in 1955, The House with a Clock in Its Walls centers on a young shy orphan boy named Lewis (Owen Vaccaro) who travels to a quiet town in Michigan to live with his very bizarre uncle John Barnavelt (Jack Black). But this is just not another town full of neon-lit theater marquees, old-timey ice cream parlors, and dingy old cars. This town has secrets. Magical ones. See, John is not your ordinary uncle. He is a Warlock whose Victorian house is alive with strange oddities like an ever-changing stained-glass window, a lazy-boy chair with a canine personality, and a room full of creepy puppets. To add an extra sense of dread, the house is full of clocks, something that Lewis doesn’t quite understand at first. Especially when he sees his uncle roam around the halls at night with his ear against the wall as if he is trying to find something. Like the town, there are secrets within this house that if exposed could unearth untold dangers. His razor-sharp smart neighbor Florence Zimmerman (Cate Blanchett) is a witch, full of charm and warmth. While both are adept and well-versed in magic, their personal flaws and tragic pasts prevent them from using their full potential. But the two see something in Lewis, and decide to tutor him in the ways of magic, all the while teaching him to embrace his individuality and make magic his own rather than just copy what they do. With a child-like sense of adventure, Lewis learns about his family and magic with peculiar legal guardians. Although, the film never seems to find its footing as it struggles to give substantial time to the plot and subplots. Lewis is the new kid in town, and like any new kid, he struggles to fit in, which is exceptionally difficult if you don’t fit into cliques. Tarby Corrigan, Lewis’s classmate, befriends him out of pity because he needs someone to play with due to his broken arm. But he is quick to throw him out just as fast as the cast comes off. He even goes as far as telling Lewis to take off his goggles so that he can be accepted as normal. There’s even a time where Lewis shuns his uncle because of those weird vibes. That doesn’t seem to develop Lewis’ character. Though there is that child-like sense of wonder we’ve come to know and love from an Amblin film and Roth’s love for scares, Lewis doesn’t seem to really grow at the moments he needs to. Instead, almost everything about The House with a Clock in Its Walls is by the numbers. Making things worse, the film never finds a way to balance out the weird and strange inside the house with the normal outside of it, organically. It can go from a chimera topiary crapping everywhere at one point and then to Lewis trying to find a friend at another point. The two never seem to coalesce. It’s as though there are two separate films going on at the same time and neither of them wants to work together. But there are some redeeming moments in the film. Black and Blanchett engage in playful ribbing, often times hurling harmless insults at each other or telling the other to choke on a cookie and die, but never really mean it. 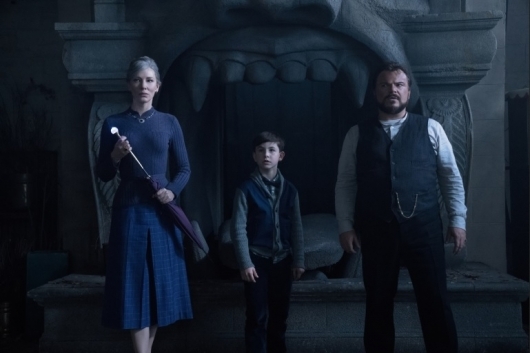 And even with those flaws The House with a Clock in Its Walls knows that it isn’t John and Florence’s story, it’s Lewis’s. So the film puts them in supporting roles and gives them a chance to shine whenever Lewis has lost his way or is in need of guidance. Set designs have that strange combination of occult aesthetics mixed with a Victorian design. It all makes for a haunted house vibe that is perfect for a house that’s not just alive but has forbidden items no one is to touch because if they do they could unleash evil. The film’s costume design is also fun. Still, I’m not exactly the target audience for this film. I can see how many of the flaws would go under a young audience’s radar, especially when there are a lot of jump scares, fart jokes, slapstick humor, and childish insults. Still, there are a few redeeming factors. Both Black and Blanchett are terrific in their supporting roles with Black as the wild eccentric but fun uncle, and Blanchett as the wonderful, warm, and charming surrogate auntie. It’s not all bad and it’s not all good. But The House with a Clock in Its Walls is mildly entertaining enough for parents and I suspect it’s going to be a blast for kids.